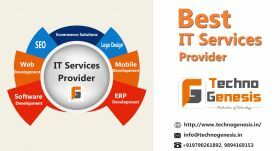 One Stop IT Software Development Services at Techno Genesis! Get Web Designing and Development Solutions, Web Application Development Solutions, Software Development Solutions, ERP Solutions, E-Commerce Solutions, Digital Marketing and Graphic Designing Solutions! Contact Top IT Services Provider in Madurai. Best IT Company in Madurai, Tamilnadu - At, Techno Genesis we provide any kind of IT services or IT solutions to your business needs. We can develop any kind of web, mobile and software applications within your budget level. Best IT Solutions To Your Business Needs! Get One Stop Solutions for Websites, Web Applications, Software Applications, E-commerce Solutions, Mobile Applications, ERP Solutions, SEO, and Graphic Designing Needs in Madurai!